Currently, Plug-n-Play (PnP) fiber systems are becoming a prevalent choice for modern data centers with its advantage of quick-connect design, while MPO and MTP fiber connectors are the mainstays for modern PnP systems. Since more and more network hardware is equipped with QSFP/SFP+/SR4/CFP/CXP ports, cables with MPO fiber connector or MTP fiber connector are becoming a requirement in these fields. However, data centers don’t have a monopoly on the technology! Anybody working with a large count of fiber that likes to save space would prefer to adopt MPO/MTP technology. With the advantage of minimizing the number of connectors and cables that enterprises are working with, MPO/MTP connectors can be found in the many other applications. 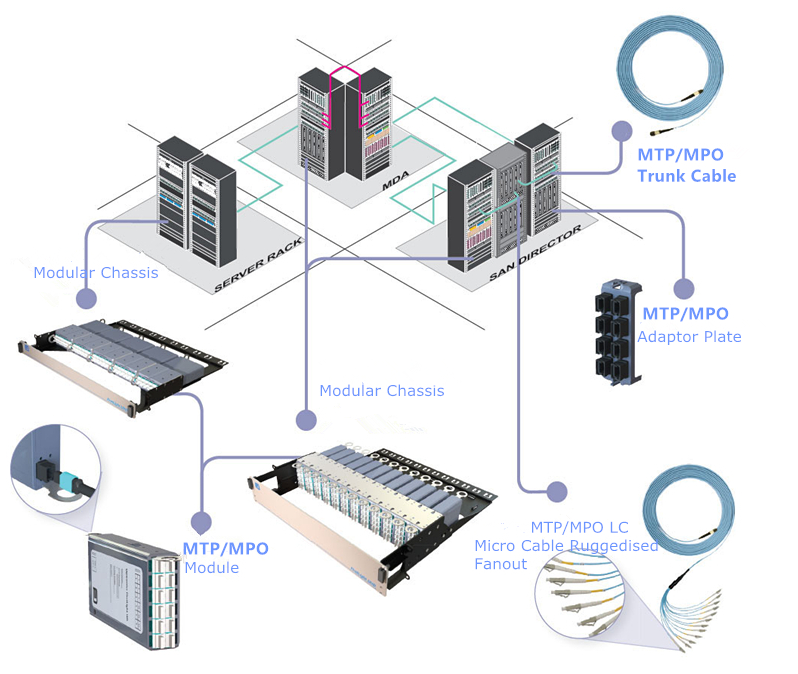 Since many years ago, installers have relied on MTP fiber connectors to speed deployment of data center installations. Today, we’ve seen the great advantages that MTP/MPO fiber connectors together with PnP system had brought to us. With their many years of high performance, ongoing improvements, and the next generation of advancements soon to come, MTP connectors will continue to deliver exceptional value for a vast range of network technologies. This entry was posted in Fiber Optic Connectors and tagged MPO fiber connector, MTP fiber connector on November 16, 2017 by Admin.